Addresses some of the criticisms and misunderstanding around Centering Prayer and offers a new perspective on the forty-year-old approach to meditation. Centering Prayer is a type of Christian meditation which can add depth to all types of prayer, and emphasises a quiet, resting and receptive openness to God. Since its emergence about forty years ago, it has been variously criticised or misunderstood, and this book aims to build a healing bridge of mutual respect and understanding. 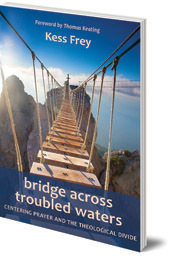 The book is written for anyone interested in Centering Prayer, to find out more about this dynamic way of having a relationship with God, and also as an invitation to its critics, to reconsider the approach in a spirit of reconciliation. Thomas Keating is a founding member and the spiritual guide of Contemplative Outreach. He has served on Contemplative Outreach's Board of Trustees since the organisation's beginning and is currently serving as the Chairman of the Board. Fr. Keating is one of the principal architects and teachers of the Christian contemplative prayer movement.